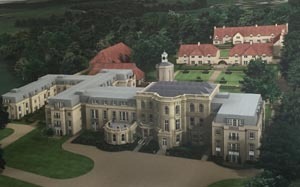 Set in countryside once owned by William the Conqueror, this new Audley luxury retirement village uses collingwood blend on the roofs of the cottages to blend in with their beautiful rural surroundings and complement the elegant central Manor House. 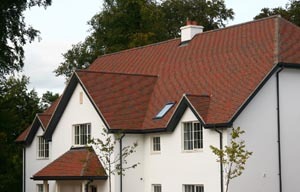 It was critical that the right rooftile was selected to add richness and quality to these new luxury homes . The architects, Gaunt Francis, share Dreadnoughts belief in the enhanced beauty imparted by the natural burnt colours of clay and were attracted to Dreadnought’s wide colour range which is produced entirely by delicate control of the traditional burning process. This means that the colour is inherent within the tile, it will not fade, unlike artificial spray-on stains, but will last for future generations and become tomorrows heritage. 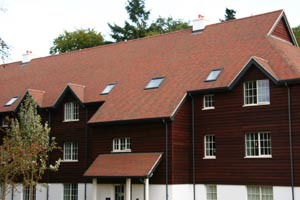 On why they chose these clay tiles, Audley Villages explains, "The standard of quality that Dreadnought Tiles provides was an ideal match for Audley where we aim to set the highest of standards in luxury retirement living". The subtle tones in Dreadnought's Collingwood blend tiles give depth and warmth to the prominent roofscape. Audley have won a number of conservation awards for their buildings and are renowned for their high quality developments. Audley Inglewood won a Gold in the "What House?" Awards for Best Retirement Village.